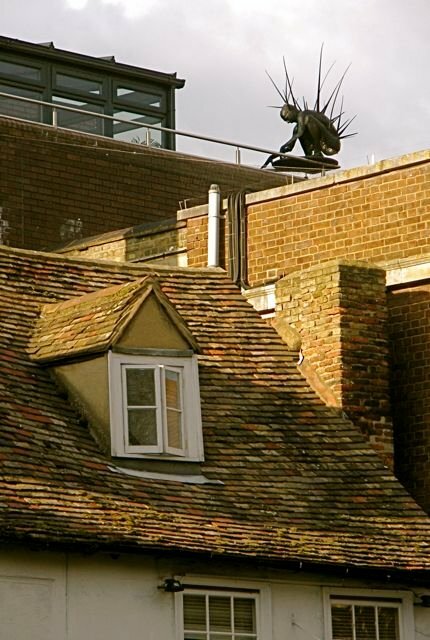 I was going to try to spin a story about this being a famous statue of Hedgehog Man, a legendary figure in Cambridge folklore, but I think I've left it too catch anyone with an April Fool now. In reality, I haven't the slightest idea what this guy is doing up on the roof or how long he's been there; I can't find any reference to this sculpture anywhere. I first noticed him a few weeks ago when I was going through my weather-vane phase and directing my gaze roofwards. I went back today to take another photograph but there is only a small area on a busy junction outside a bustling sweetshop where you can get this view; as I stopped on my bike and fished my camera out, it started to pour with rain and a bus passed, spraying me head to foot with puddle water. So I gave up, and decided to post this older version. Hedgehog Man is also only a few buildings away from the nice French restaurant we went to this evening, celebrating the fact that it's the last day of term and both boys are off at sleepovers with their friends! I did manage to play one April Fool this morning though; I sewed up the bottoms of Will's jeans last night; when he tried to put them on this morning, there were a few moments of increasingly frantic foot-wiggling before he cottoned on! Love the story of your joke on Will! I'm not sure what to say about this sculpture! I do, however, love the roof & shingles...it speaks to me of "rural England"... (Pretty good April Fool's joke, too, BTW! Heehee! He's amazing!!! I don't think any of neighbours would leave the safety of their hallways if they woke up and suddenly saw this appearing....it's like something from a Victor Meldrew sketch! Really interesting - and you're a great story-teller! That is one strange looking fellow up there. Love the photo!